The native form of this personal name is Vitéz jákfai Gömbös Gyula. This article uses the Western name order. Gyula Gömbös de Jákfa (26 December 1886 – 6 October 1936) was a Hungarian military officer and politician, and served as Prime Minister of Hungary from 1 October 1932 until his death on 6 October 1936. Gömbös was born in the Tolna County village of Murga, Hungary, which had a mixed Hungarian and ethnic German population. His father was the village schoolmaster. The family belonged to the Hungarian Evangelical (i. e. Lutheran) Church. Gömbös entered the Austro-Hungarian Army as a cadet in Pécs and quickly became a member of the officer corps, serving as a captain during World War I. While in the army, Gömbös became a staunch advocate of Hungary's gaining independence from Austria and a bitter critic of the Habsburgs. After World War I ended and Hungary split from Austria, Gömbös joined Conservative Hungarian forces in Szeged that were unwilling to support Communist Béla Kun, who had seized control of Hungary in 1919, forming his own paramilitary group, the Hungarian National Defence Association (Magyar Országos Véderő Egylet, or MOVE). Gömbös became a close ally of Miklós Horthy, the leader of the anti-Communist government in Szeged, and played a leading role in organizing Horthy’s army. For his services, Gömbös was made minister of defense in the Szeged government. After Kun’s government was ousted in August 1919, Gömbös helped direct the purge of Communists from Hungarian society. Gömbös also supported certain political actions against Hungary’s Jews. Gömbös had been a Smallholder before the war, but veered sharply to the right in the upheaval following the breakup of Austria-Hungary. After Miklós Horthy was made regent of Hungary in 1920, Gömbös became the primary leader of Hungary’s emerging nationalist movement, which was gaining some support from the people in response to the brief period of Communist rule and the signing of the Treaty of Trianon, which resulted in Hungary losing two-thirds of its territory to neighboring nations. 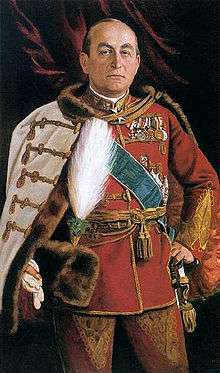 Despite some disagreements with Horthy, Gömbös was active in the widespread purge of Hungarian Communists and later organized mass military opposition to the Habsburg pretender Charles IV's plan to regain his throne in 1921, a move which kept Horthy firmly in control of Hungary. Later that year, Gömbös became one of the primary leaders of the opposition to Prime Minister István Bethlen. In 1929, Gömbös was made a major general and appointed Minister of Defense in the Bethlen government by Horthy. 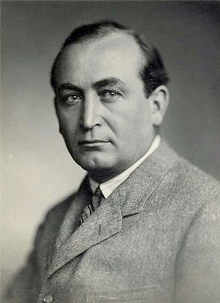 In 1932, Horthy appointed Gömbös prime minister and made him promise not to ask for new elections. Gömbös publicly recanted his previous anti-Semitism when taking office. The Jewish leadership under Stem and Szanto supported the appointment of Gömbös and his programs in exchange for Gömbös promising not to enact any anti-Jewish laws and through his policies not cause economic harm to the Jews, a promise which Gömbös kept. While prime minister, Gömbös was very active in international politics, seeking support for revising the Treaty of Trianon and trade to revive the disastrous economy. One of his major goals was to align Hungary into an Axis with Italy and Austria. Shortly after becoming prime minister, Gömbös flew to Italy and visited Benito Mussolini. The two came to an accord, and Mussolini gave Gömbös his support for the revision of the Treaty of Trianon. Mussolini also promised Gömbös Italy’s aid if Hungary went to war with Yugoslavia and Romania in an attempt to regain Hungary’s former territory from those nations. Gömbös also formed an alliance with Germany. When Adolf Hitler became Chancellor of Germany in 1933, Gömbös became the first foreign head of government to visit the Nazi leader. Shortly thereafter, Gömbös signed a major trade agreement with Germany which would greatly improve Hungary’s ailing economy as the 1930s progressed. Gömbös eventually decided to align Hungary primarily with Italy and Austria when Hitler made it clear to Gömbös that while he would support Hungary in an effort to regain land from Czechoslovakia, he would not support Hungary against Romania or Yugoslavia. Hitler was also against Gömbös’ plans to expand the size and power of the Hungarian military, while Mussolini supported the idea. However, Gömbös never lived to see his ambitious plans come to fruition. Gömbös, after a long illness, died of testicular cancer in Munich on 6 October 1936. Gömbös was buried at Kerepesi Cemetery among exceptional circumstances, his funeral procession was attended by hundreds of thousands of Hungarians, his Catafalque was visited by many dignitaries of his time since he was head of government. ↑ "Magyar Protestáns Panteon - Gömbös Gyula" [Hungarian Protestant Pantheon] (in Hungarian). Retrieved 2014-02-07. ↑ Earlier accounts had kidney failure as the cause of death. See Püski, Levente (2006). A Horthy-rendszer [The Horthy System] (in Hungarian). Budapest: Pannonica. pp. 104–6. Kürti, László (2006). "Gömbös, Gyula". In Blamires, Cyprian. World fascism: a historical encyclopedia. 1. Santa Barbara, California: ABC-CLIO. pp. 285–286. ISBN 1-57607-940-6. Wikimedia Commons has media related to Gyula Gömbös.